EDIT: Made a small change to the bottom panel. 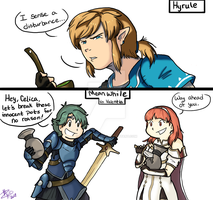 Ohh boy, an easter egg, I better throw away my precious Falchion who I got from my father.... :v But that expression, 10/10 nice comic! 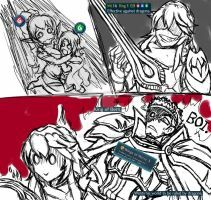 I guess Lucina had enough of those Sword Breakers. I don't play FE Heroes, so can someone PLEASE explain why Xander has... This? Easter unit variations. 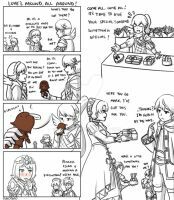 Xander, Camilla, Chrom, and Lucina all have em for this event. It has the Mark Of The Eggxalt! That Corn has made his choice. I was expecting to see more corny jokes. If anyone has any, I'm all ears. I'm definitely missing something here. "No Lucy! Don't touch that e..."
Why did you cut half of the comic xd? Look again lol, made a mistake. The sad thing is that I can actually see that happening. I NEED CORN CORRIN TO BE A THING!